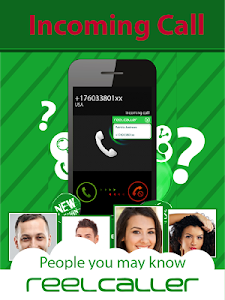 Reel caller Plus- New phone book : Search for any Arab mobile number in our phone book directory. New design and enhance the user interface . Free and unlimited search by name and by mobile number. The service was created to ease people’s search for things (ex. taxi) or people no matter where they are and what are they searching for. Also, the need for more customization has led us to create features that would leave no user unsatisfied . - An international telephone directory application that allows the users to identify an owner of the number by name while he calls. As well as previously searching by name, number, or keyword, both from within the wide Reelcaller network. - Enables you to assign multiple keywords to your profile, as to make sure it will appear when a relevant search is done. 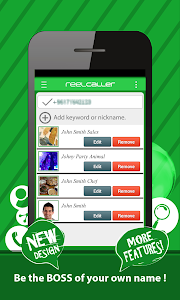 Reel Caller is the best Arabic / English caller ID and search engine for identifying real and true caller. It has more intelligence than other search engine. 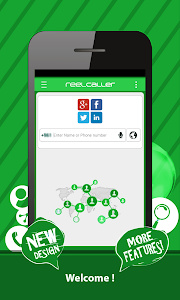 Reel Caller lets you search beyond your existing phone book list, identify unknown incoming calls and names. *Caller ID (identify a caller based on the Reelcaller user network). Whether you have the caller saved in the contacts or not, upon receiving a call you will get a pop-up notification with the name the caller has assigned to himself/herself within the Reelcaller network. *Create your profile, add keywords, and nicknames . *Unlock the limited search results for keywords and nicknames . 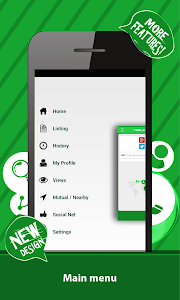 *See who is searching for you and viewing your profile . *View mutual and near-by users . **These incredible functions are worth 1 local SMS only! 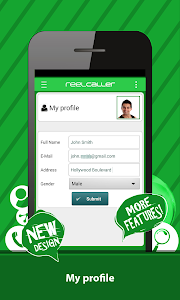 Reelcaller originated from the word reel, around which the information provided by the users is revolving. Similar to "Reel caller Plus-New phonebook"